CEH scientists will be joining thousands of colleagues from around the world to present research updates to the European Geosciences Union General Assembly in Vienna next week (17-22 April 2016). 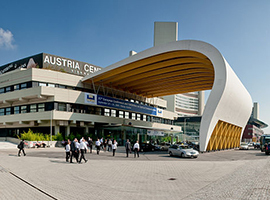 The annual meeting, at the Austria Center in Vienna, looks at all aspects of Earth, planetary and space sciences. This year's theme is the Active Planet. While a lot of the media focus at EGU is often on space science, the breadth of research on show is staggering: the EGU General Assembly is a massive event with hundreds of oral presentations, PICO sessions and poster presentations taking place each day on a range of topics including natural hazards, climate change, soil processes, land management, remote sensing, digital mapping and science communication. This year our staff and students will be presenting on subjects including drought monitoring, peatland carbon, land-atmosphere modelling, greenhouse gas emissions and nanoparticles. Our work with collaborating institutes will also be highlighted in numerous other presentations. Eddy covariance flux measurements of net ecosystem carbon dioxide exchange from a lowland peatland flux tower network in England and Wales. Presented by Ross Morrison. From drought indicators to impacts: developing improved tools for monitoring and early warning with decision-makers in mind. Presented by Jamie Hannaford. Long-term P weathering and recent N deposition control contemporary plant-soil C, N and P. Presented by Ed Tipping, working with Lancaster University. Coupled C, N and P controls on photosynthesis, primary production and decomposition across a land use intensification gradient and implications for land atmosphere C exchange. Presented by Sabine Reinsch. Climate-driven trends in the occurrence of major floods across North America and Europe. Presented by Jamie Hannaford (research led by the US Geological Survey). Seasonal and spatial variability of aquatic N2O, CH4 and CO2 concentrations and their contribution to the overall greenhouse gas budget of the river Tay catchment, NW Europe. Presented by Ute Skiba. Global observation-based diagnosis of soil moisture control on land surface flux partition. Presented by Belen Gallego-Elvira. The mysteriously variable half-life of dissolved organic matter in aquatic ecosystems: artefact or insight? Presented by Chris Evans. The C:N:P:S stoichiometry of soil organic matter. Presented by Ed Tipping. Forecasting surface water flooding hazard and impact in real-time. Presented by Steven Cole. A national framework for flood forecasting model assessment for use in operations and investment planning over England and Wales. Presented by Steven Wells. A cascade approach to uncertainty estimation for the hydrological simulation of droughts. Presented by Katie Smith. Verifying the UK N2O emission inventory with tall tower measurements. Presented by Ed Carnell. The effect of random and systematic measurement uncertainties on temporal and spatial upscaling of N2O fluxes. Presented by Nicholas Cowan. Comparing net ecosystem carbon dioxide exchange at adjacent commercial bioenergy and conventional cropping systems in Lincolnshire, United Kingdom. Presented by Ross Morrison. Signal-to-noise issues in measuring nitrous oxide fluxes by the eddy covariance method. Presented by Nicholas Cowan. Coupled carbon-nitrogen land surface modelling for UK agricultural landscapes using JULES and JULES-ECOSSE-FUN (JEF). Presented by Edward Comyn-Platt. Further evaluation of wetland emission estimates from the JULES land surface model using SCIAMACHY and GOSAT atmospheric column methane measurements. Presented by Garry Hayman. Contrasting responses of shrubland carbon gain and soil carbon efflux to drought and warming across a European climate gradient. Presented by Sabine Reinsch. Uncertainties in transient projections of maximum and minimum flows over the United States. Presented by Ignacio Giuntoli. Field measurements of dissolved organic carbon in water using a new UV miniaturised Fourier Transform Spectrometer. Presented by Paul Scholefield. A modelling framework for the transport, transformation and biouptake of manufactured nanoparticles in the aquatic environment. Presented by Stephen Lofts. Additionally, Eiko Nemitz is a co-convenor on session BG2.12 Biosphere-atmosphere exchange of reactive trace gases and aerosols. Ute Skiba is a co-convenor on session BG9.1 Climate impact of land management and competition between food and energy crops, and is chairing the poster session for that event. Richard Williams is a co-convenor on session HS5.10 Assessment and interpretation of state and trends in water quality and Christel Prudhomme is a co-convenor on session HS4.4 Drought and water scarcity: monitoring, modelling and forecasting to improve hydro-meteorological risk management. Finally, CEH Research Fellow Professor John Burrows was the recipient of the European Geophysical Union's Alfred Wegener Medal 2016. Check out the full session programme on the General Assembly website.